The National Football League on Wednesday approved a new policy that could fine teams if players don't stand for the national anthem, but at least one of the top team executives doesn't plan on penalizing its players for their right to protest. 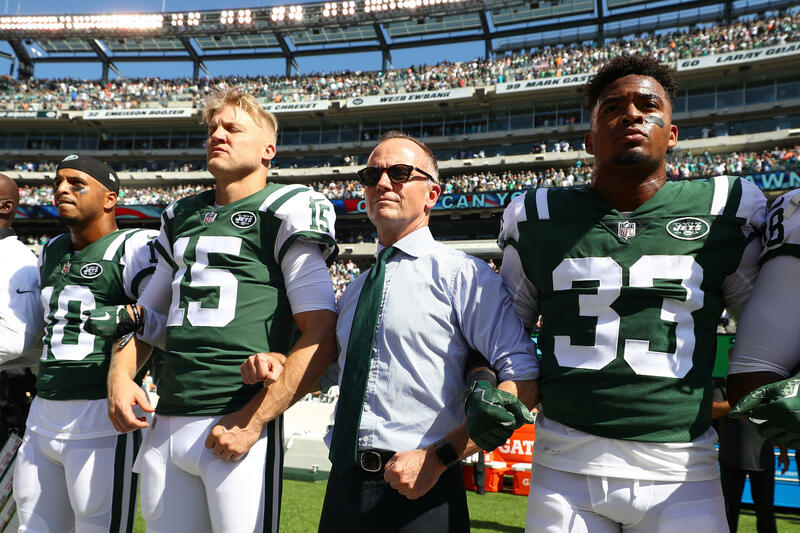 New York Jets chairman and CEO Christopher Johnson told Newsday he would pay any fine handed down by the NFL, allowing players to freely kneel during the "Star-Spangled Banner" –– without fear of repercussions from the team. On Wednesday, league owners approved the mandate that requires players to stand if they're on the field or stay in the locker room during the anthem. Any violations of the policy would result in fines from the NFL against the team -- not the players -- but an organization would be allowed penalize a player as they see fit. Johnson, who is serving as the team's acting owner while his brother Woody serves out his term as the U.S. Ambassador to the Britain, issued a statement shortly after the decision was announced by NFL commissioner Roger Goodell. "As I have in the past, I will support our players wherever we land as a team," he said. "Our focus is not on imposing any club rules, fines, or restrictions." Johnson elaborated further in an interview with Newsday, saying the protests are part of a bigger picture problem that is important to his players. "If somebody [on the Jets] takes a knee, that fine will be borne by the organization, by me, not the players." Johnson said. "I never want to put restrictions on the speech of our players. Do I prefer that they stand? Of course. But I understand if they felt the need to protest. There are some big, complicated issues that we're all struggling with, and our players are on the front lines. I don't want to come down on them like a ton of bricks, and I won't. There will be no club fines or suspensions or any sort of repercussions. If the team gets fined, that's just something I'll have to bear." The owners spent several hours addressing the contentious issue, which has reached all the way to the White House. Last fall, President Trump repeatedly lashed out against the NFL on Twitter for not intervening in the ongoing silent protests carried out by players across the country. In September, he had advice for NFL owners: fire players who kneel. "That's a total disrespect of our heritage. That's a total disrespect of everything that we stand for," Mr. Trump said at a political rally in Alabama, encouraging owners to act.